Recumbent stone circles were sometimes built in groups and are often inter visible. At Midmar Kirk 1½ miles to the west of Sunhoney, up the second road on the right, there is a stone circle in the kirkyard. When the kirkyard was set out this circle was grassed-in. 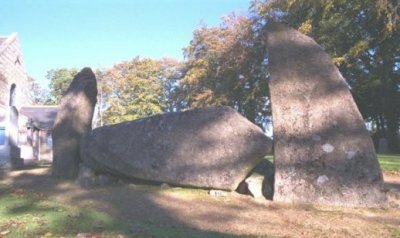 It is all in pink granite with five stones still standing, plus the tall pointed flankers on either side of the long recumbent. The chock-stones holding the recumbent level are still visible underneath, and also some interesting possibly quite old graffiti and a masons mark can be seen on the top surface. This is one of many stone circles close to a kirk. Most of the others were buried, destroyed, built over or incorporated as building material in old circular kirk walls or foundations. Look through the trees to the east to see Sunhoney across the fields. There are more standing stones nearby, one in the field across the road west of the kirk and another tall stone (Balblair stone) 100 m into the woods to the north of the kirk. An old local tradition has it that this is the lone survivor of another stone circle.